This skill tree is made for the players, who like to do a lot of damage, but still be pretty mobile and want to be able to be the fastest and most independent player of the team, who can run from the enemy or help fast other teammates. So you're in fact playing a fast fugitive with only small armor, who can play a healer role partially. You can revive your teammates and heal them aswell. You can save your whole team from dying because of your high speed and low chance to be hit. You can view this skill tree online by CLICKING HERE. CAREFUL: In order to be effective, you need to equip AKIMBO PISTOLS as primary weapon, ANY PISTOL as secondary weapon, LIGHT BALLISTIC VEST as armor, CROOK as perk deck and try to reach the LOWEST DETECTION RISK you can (under 35 is good, under 20 very good, under 10 is great!). - allows you to revive your teammates just by shouting at them from the near distance (75% success) and you revive them 50 % faster. Reviving gives you both bonuses. - If you're downed, you're instantly revived if you kill an enemy with pistol - you have 3 charges of this ability. - You have 2 doctor bags with 2 charges or 7 small first-aid-kits. I would prefer using FAK, because you don't have any healing skills and you have quite an independent player because of your movement speed, so you have to heal yourself fast and effective, not to be turnt over the others. - Your skill support the use of PISTOLS, as both primary and secondary weapon. You have to use Akimbo pistols as primary weapon, otherwise you're wasting your talents. For the list of prefered weapon builds, please see next chapter. - You have 6 cableties to be able to controll the mission even when your group is not full and there are a lot of civilians. 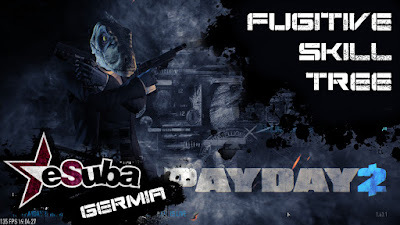 - You have strong intimidation, you can even intimidate some enemies into a hostage (in stealth) or persuade them to fight on your side. They could be then traded for your teammate in custody. It´s great for tough mission with no civilians in sight. - You skills are giving stability bonuses to your weapons. - You have a high chance to DODGE enemy fire. That means, the chance of enemy forces hitting you is significantly decreased and that's why you can run in loud heists only with light ballistic vest. - You can use your primary weapon in bleedout. - You are made for carrying bags - you carry them as fast as it could be boosted and you interact with them as fast as it could be boosted, your throwing skill is boosted too. - CROOK - The BEST perk deck to combine with this skill tree is crook. It gives you 40% higher chance to dodge enemy fire and I don't recommend using this skill tree without this perk deck. - ROGUE - This perk gives you 25% chance to dodge enemy fire, you're less targeted, when close to your teammates, you have 25% chance to pierce enemy armor. 2) Make sure you´re using proper weapons for this skill tree. You have to use Akimbo pistols as primary and any pistol as secondary weapon. 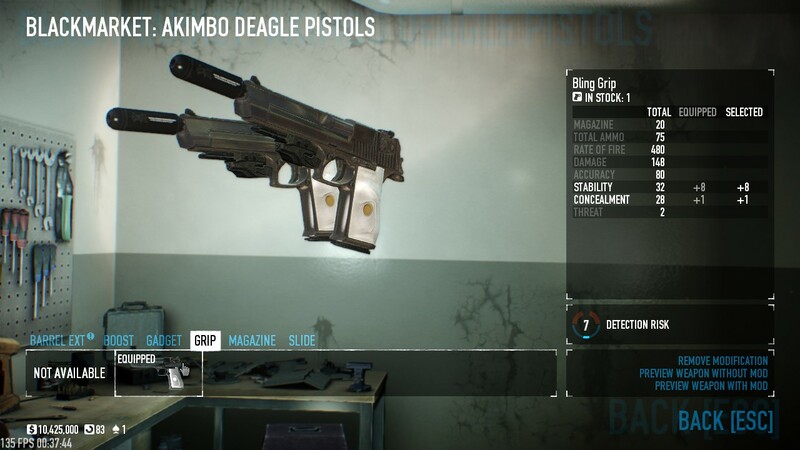 I prefer using Akimbo Desert Eagles with modification for concealment = Bling grip, concealment boost (when using silencer, than max. Champions silencer) because you have to deal a lot of damage and DE are the highest damage-dealing pistols you can use. - Crosskill pistol (enhanced with concealment boost, flash hider, ergo grip or engraved crosskill grip, marksman sight and vented slide) - you can reach the best stats with these modifications. 3) This skill tree needs to be used with first aid kits (or doctor bags) - You have 7 FAK, that could be deployed really fast and heal your whole health. It doesn't heal the amount of your deaths like doctor bag, but is more mobile and practical for you. With the skills you go down (death) on the 4th time, because of your fugitive skill Pistol messiah. 4) It's best useful on big loud heists like Meltdown or Dockyard because of your mobility. 5) Your chance to dodge enemy fire is best when you run and then when you crouch, so it's really wise to be a moving target and crouch when interacting with things. 6) This skill tree is not good for carrying bags. Your dodge chance is best by crouching and running and not being able to run by carrying bags is a great disadvantage for you. I hope you like this guide I made with a little help of my more experienced friends. 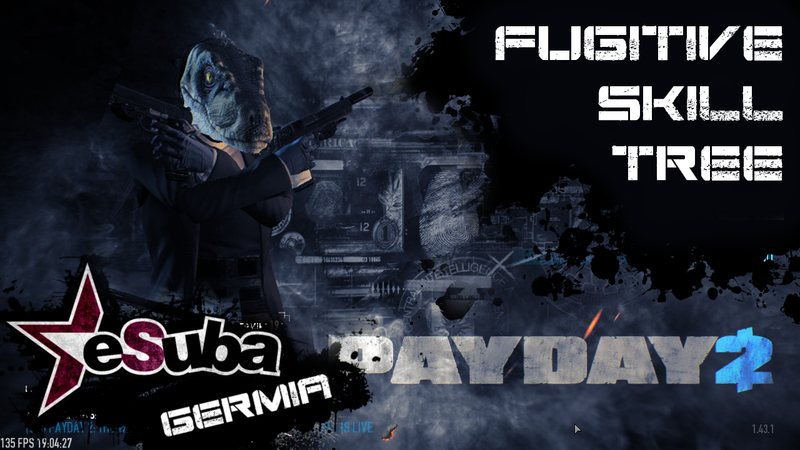 Keep in mind, it´s something, that fits my gameplay, it´s not an universal guide into Payday and enjoy!